Nickname(s): "The Key City", "City of Five Flags", "Masterpiece on the Mississippi," "The Scenic Sunshine City"
It is one of the few large cities in Iowa with hills, and a tourist destination featuring the city's unique architecture and river location. It is home to five institutions of higher education, making it a center for culture and learning. The first permanent settler in what is now Dubuque was Quebecois pioneer Julien Dubuque, who arrived in 1785. In 1788, he received permission from the Spanish government and the local Meskwaki of American Indians to mine the area's rich lead deposits. Control of Louisiana and Dubuque's mines shifted briefly back to France in 1800, then to the United States in 1803, following the Louisiana Purchase. Dubuque died in 1810. The Meskwaki continued to mine with full support of the U.S. Government until 1830, when the Meskwaki were illegally pushed out of the mine region by American prospectors. Saint Mary's, one of 11 Catholic churches in Dubuque. 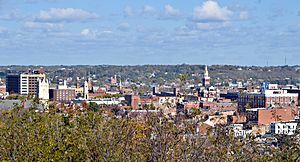 The current City of Dubuque was named after Julien Dubuque, settled at the southern end of a large flat plain adjacent to the Mississippi River. The city was officially chartered in 1833, located in unorganized territory of the United States. The region was designated as the Iowa Territory in 1838, and was included in the newly created State of Iowa in 1846. After the lead resources were exhausted, the city became home to numerous industries. Dubuque became a center for the timber industry because of its proximity to forests in Minnesota and Wisconsin, and was later dominated by various millworking businesses. Also important were boat building, brewing, and later, the railroad industry. Between 1860 and 1880, Dubuque was one of the 100 largest urban areas in the United States. Iowa's first church was built by Methodists in 1834. Since then, Iowans have followed a variety of religious traditions. Early in the 20th century, Dubuque was one of several sites of a brass era automobile company, in this case Adams-Farwell; like most others, it folded. Subsequently, Dubuque grew significantly, and industrial activity remained the mainstay of the economy until the 1980s. During that time, a series of changes in manufacturing and the onset of the "Farm Crisis" led to a large decline in the sector, and the city's economy as a whole. However, the economy diversified rapidly in the 1990s, shifting away from heavy industry. Today, tourism, high technology, and publishing are among the largest and fastest-growing businesses. Dubuque attracts well over 1,500,000 tourists annually, and this number continues to increase. The city has encouraged development of the America's River Project's tourist attractions in the Port of Dubuque, the expansion of the city's colleges, and the continued growth of shopping centers, such as Asbury Plaza. Dubuque has received a number of awards and recognition for its redevelopment during the past decade. 2001-1st recipient of the Vision Iowa Grant, awarded for $40 million to revitalize the Port of Dubuque. 2006- Audrey Nealson Community Development Achievement Award that is given out by the National Community Development Association. The award recognized exemplary uses of Community Development Block Grant (CDBG) funds which best addressed the needs of low-income families and neighborhoods. 2006-Money Magazine identified Dubuque as having the "shortest commute time" - 11.8 minutes, of all U.S cities. April 2007- ranked 15th in the "Best Small Places For Business and Careers'" ranking by Forbes magazine, climbing 60 spots from 2006. June 2008-Named as the "Most Livable" Small City by the United States Conference of Mayors (USCM). 2009-Dubuque was honored as the United States Department of Commerce's Excellence in Economic Development for Excellence in Historic Preservation-led Strategies. Dubuque received the award for its commitment to research-based, market driven economic development in helping grow the local economy. 2009-one of America's Top 100 Places to Live, by RelocateAmerica.com's . 2009-"America's Crown Community Award," by American City and Country Magazine, for collaboration that resulted in IBM's decision to locate a new global technology service delivery center in Dubuque. In 2010-Forbes has selected Dubuque as the best small city to raise a family in the country. 2010-ranked as the third best city for job growth by careerbuilder.com. 2011-2010 Drinking Water Safe Revolving Loan Fund Award by EPA for Sustainable Public Health Protection. 2013- Third All-America City Award, one of 10 cities recognized nationally. 2014- USA Today named Dubuque the fourth "Best American Riverfront." 2015- ASA D Northern National Men's Slow Pitch Champions. Team: Kass & Co.
Dubuque is located at (42.504321, -90.686865). The area is made up of several distinct neighborhoods, each of which has a unique history and character. These neighborhoods include: Cable Car Square/Cathedral Square, the Central Business District, Jackson Park/Upper Main, Lower Main, and the Warehouse District. An area of special note within Downtown Dubuque is the Port of Dubuque, which has seen a massive amount of new investment and new construction. The downtown area includes a number of significant buildings, many of which are historic, reflecting the city's early and continuing importance to the region. Eagle Point Park in Dubuque's North End. Dubuque's North End area was first settled in the late 19th century by working-class German immigrants to the city. 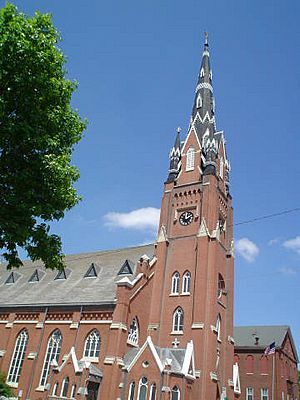 The German-American community in Dubuque sought to establish their own German Catholic churches, separate from the Irish Catholic churches in Dubuque's downtown and South End. Today, the area still retains its working-class roots, and is still home to some of the largest factories operating in Dubuque. The North End is roughly defined, but generally includes all of the territory north of 17th Street, and east of North Grandview Avenue and Kaufmann Avenue. The area is made up of two main hills (west of Central Avenue, and west of Lincoln Avenue), and two main valleys, the Couler Valley (between the two hills), and the "Point" neighborhood, adjacent to the Mississippi River. It is home to Dubuque's two main cemeteries, Linwood Cemetery (established for Protestants), and Mt. Calvary Cemetery (established for Catholics). 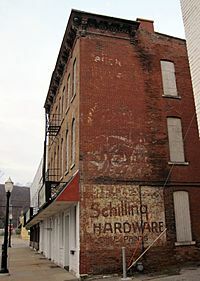 The South End has been the traditional neighborhood of Irish-Americans in the city, and became known as "Little Dublin," specifically centered around southern portions of Downtown Dubuque. Remnants of Irish culture still survive in the South End, with Irish pubs such as Murph's South End Tap, The Lift, and stores such as Shamrock Imports still operating in the area. 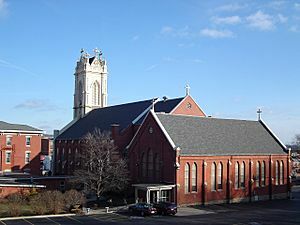 Irish culture in Dubuque also revolves around the city's Irish Catholic churches, namely: St. Columbkille's, St. Patrick's, and St. Raphael's Cathedral. Today, the South End is much larger, and includes all of the land south of Dodge Street, east of Fremont Avenue but including areas of west of it, and north of the Key West area. The South End has many of the city's "old money" neighborhoods, especially along South Grandview and Fremont Avenues, and around the Dubuque Golf & Country Club. Many South End neighborhoods have a more spacious and park-like appearance, contrasting with the more urban North End. Dubuque has a humid continental climate (Köppen Dfa), which gives it four distinct seasons. However, local weather is often not as extreme as that found in other parts of the Midwest, such as Minnesota or Wisconsin. Spring is usually wet and rainy, summers are sunny and warm, autumn is mild, and winters are typically cloudy and snowy. The Fourth Street Elevator (also known as the Fenelon Place Elevator ) is located in Downtown Dubuque. 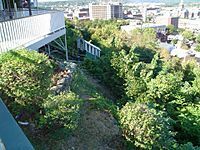 This elevator, which is the shortest and steepest railroad in existence, takes passengers up and down one of the large bluffs that dominate the city. The Grand Opera House, a large, grandiose theatre in the downtown district, is one of the epicenters of Dubuque's thriving local theatre scene. Designed by Willoughby J. Edbrooke, it was erected in 1890 and is on the register. The Shot Tower, which was used to produce lead shot and is one of the few such towers left in existence, is also a National Historic Landmark. There are a number of notable parks in Dubuque, particularly Eagle Point Park and the Mines of Spain State Recreation Area. Dubuque's waterfront features the Ice Harbor and just north of it, the Diamond Jo Casino and Grand River Event Center. Land for this project was acquired from several businesses through condemnation of their properties under eminent domain. The city is home of the Dubuque Fighting Saints. They began playing in the Tier I Junior A United States Hockey League in the Fall of 2010 at the new Mystique Ice Center. Dubuque was home to the original Fighting Saints team from 1980-2001 when the team relocated to Tulsa, Oklahoma. From 2001-2010 The Dubuque Thunderbirds replaced the Fighting Saints playing in the Tier III Junior A Central States Hockey League at the Five Flags Center. The 2010-2011 Fighting Saints were USHL Clark Cup Champions after defeating the Green Bay Gamblers three games to one in the best-of-five Clark Cup Final. In 2013 the Fighting Saints again won the Clark Cup, defeating the Fargo Force three games to none in the best-of-five Final. The team averaged over 2,600 fans per game in the 2013-2014 regular season, the highest average in team history. Dubuque's daily newspaper, the Telegraph Herald (or the "TH", as it is known locally), had a daily circulation of nearly 31,000 as of January 27, 2007. Several other important papers and journals also operate in the city, including Tri-State Business Times (monthly business paper), 365ink Magazine (bi-weekly alt/cultural magazine), Julien's Journal (monthly lifestyle magazine), the Dubuque Advertiser (advertisement paper) and the "Tri-States Sports Look" (local sports publication). Dubuque and surrounding areas are in the Cedar Rapids/Waterloo/Dubuque broadcast media market, which is monitored by the A.C. Nielsen Company for audience research data for advertisers. For years, Dubuque had a local TV news station (KFXA/KFXB Fox 28/40) until 2004, when that station became an affiliate of CTN. Currently, the Dubuque-based TV news is covered by KWWL-TV7 (Waterloo), and KCRG-TV9 (Cedar Rapids); both operate news bureaus in the city, and most of the city's major stories are covered by those stations. Since the closing of KFXA/KFXB, KWWL-TV has captured a majority of the local news market in Dubuque. Various scenes from Field of Dreams (1989) were filmed in Dubuque, with the majority of the filming (and the actual field from the movie) located in nearby Dyersville, Iowa. Dubuque is the main town in the Dubuque metropolitan area. It is at the junction of four major highways and two major railroads. Its location along the river has formed the city into a major Midwestern hub. The Dubuque Area is the general area encompassing Dubuque, Iowa. The area includes Dubuque County exclusively, and un- officially, but locally includes: Jackson County, Iowa, Jo Daviess County, Illinois, Grant County, Wisconsin. The official population of the Dubuque County was 93,653 as of the 2010 population estimates. Although, if you include the unofficial counties, the area's population is near 190,000. Platteville - Platteville is the largest city in Grant County, and Southwest Wisconsin. 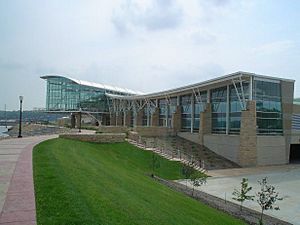 University of Wisconsin-Platteville (UWP),is located there. 10,000 people call Platteville home. Platteville is considered a micropolitan area. Galena - Galena is Midwest — renowned for being a quaint mid-America town with boutiques and hundreds of shops along main street. Home of General Grant and eight other Civil War Union Generals. Some of the shops include furniture shops, several candy shops, multiple Bed and Breakfast establishments, a number of bars, and many gift shops as well. The town sits along the Galena River which runs to the Mississippi River. The population of Galena ranges between 3,500 and 4,000, making it easily the largest city in Jo Daviess County, Illinois. Asbury - At 4,170, Asbury is the second largest city in Dubuque County, surpassing Dyersville, Iowa in 2010. Asbury is a prime and vital suburb of the Dubuque area. Asbury has developed mass commercial districts along the Northwest Arterial, Highway 32 in Dubuque. It is likely that Asbury will continue to grow, and reach the 10,000 population mark in less than 15 years. As of the census of 2010, there were 57,637 people, 23,506 households, and 13,888 families residing in the city. The population density was 1,923.2 inhabitants per square mile (742.6/km2). There were 25,029 housing units at an average density of 835.1 per square mile (322.4/km2). The racial makeup of the city was 91.7% White, 4.0% African American, 0.3% Native American, 1.1% Asian, 0.5% Pacific Islander, 0.6% from other races, and 1.8% from two or more races. Hispanic or Latino of any race were 2.4% of the population. As of the census of 2000, there were 57,686 people, 22,560 households, and 14,303 families residing in the city. The population density was 2,178.2 people per square mile (841.1/km²). There were 23,819 housing units at an average density of 899.4 per square mile (347.3/km²). The racial makeup of the city was 96.15% White, 1.21% Black or African American, 0.19% Native American, 0.68% Asian, 0.11% Pacific Islander, 0.69% from other races, and 0.96% from two or more races. 1.58% of the population were Hispanic or Latino of any race. There were 22,560 households out of which 30.0% had children under the age of 18 living with them, 50.3% were married couples living together, 10.0% had a female householder with no husband present, and 36.6% were non-families. 31.0% of all households were made up of individuals and 12.6% had someone living alone who was 65 years of age or older. The average household size was 2.37 and the average family size was 2.99. Age spread: 23.6% under the age of 18, 11.8% from 18 to 24, 26.5% from 25 to 44, 21.6% from 45 to 64, and 16.5% who were 65 years of age or older. The median age was 37 years. For every 100 females there were 90.0 males. For every 100 females age 18 and over, there were 86.2 males. Since its founding, Dubuque has had, and continues to have, a strong religious tradition. Local Catholic settlers established what would become the first Christian church in Iowa, St. Raphael's Cathedral, in 1833. The city also played a key role in the expansion of the Roman Catholic Church into the Western United States, as it was the administrative center for Catholics in what is now Iowa, Minnesota, North Dakota, and South Dakota. Many important Catholic religious leaders have lived in Dubuque, including Father Samuel Mazzuchelli, Bishop Mathias Loras, Clement Smyth, and Mother Mary Frances Clarke. Roman Catholic parishes around the city include Saint Raphael's Cathedral Saint Mary's, Sacred Heart, Holy Ghost, Saint Patrick's, Saint Joseph the Worker, Resurrection, Saint Columbkille's and Saint Anthony's. Since the 1870s the religious character of the area is still dominated by the Roman Catholic Church. In 2010, Catholic adherents who regularly attended services made up about 53% of Dubuque County residents. This contrasts with Iowa as a whole, which was about 17% Catholic in 2010. The city proper is home to 52 different churches (11 Catholic, 40 Protestant, 1 Orthodox), 1 Jewish synagogue, and 1 mosque. In addition to churches, 5 religious colleges, 4 area convents, and a nearby abbey and monastery add to the city's religious importance. Most of non-Catholic population in the city belongs to various Protestant denominations. Dubuque is home to three theological seminaries: St. Pius X Seminary (Dubuque, Iowa), Minor (College) Seminary for Roman Catholic men discerning a call to ordained priesthood, the University of Dubuque, with the Presbyterian Church USA, and the Wartburg Theological Seminary, with the Evangelical Lutheran Church in America. These latter two institutions train both lay and ordained ministers for placements in churches nationwide. Dubuque, Iowa Facts for Kids. Kiddle Encyclopedia.